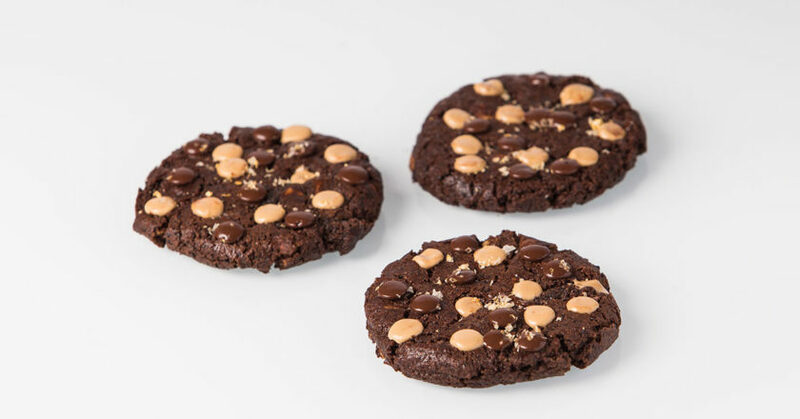 Celebity chef Darren Purchese of Belgium chocolate maker Callebaut and Burch & Purchese Sweet Studio has put together a chocolate and coffee cookie recipe that will give Santa the energy boost he needs on Christmas Eve. Darren says it also wouldn’t hurt if someone needs a 3pm pick me up. Cream the butter, brown sugar, caster sugar, salt, and bicarbonate soda together with a beater. Mix for two minutes on a medium speed and then scrape down the sides. Mix for three minutes on a medium to high speed then scrape down sides. Add the egg gradually while continuing to beat on a low to medium speed. Add all egg in and mix well before scraping down the sides. Add the flour, cocoa powder, coffee, and chocolates and beat slowly until it is all incorporated. Weigh the mix into 85 gram balls and chill. Bake in an oven for 17 minutes, remove from the oven and press gently with a weight. Add dark chocolate and GoldCallet chocolate buttons to the top and melt.